"Will you rescue me again, pretty please?" And just like last month at the Quad State Quad Buster, dear friend Caren Jew arrives to give me a ride in a race where I drop out. For the first half of the run my feet remain amazingly dry, thanks to lucky leaping across streams and fortuitous stepping-stone tip-toeing. Then a mega-mud-wallow surrounded by thorn bushes forces my hand, or rather, foot, into the muck. The final scary-deep water crossing near near Watkins Rd washes off some grime but leaves socks soaked. Caren insists that it's ok, but I feel guilty dripping on the floor of her nice car. A DNF ("Did Not Finish") after 48 miles of a 50 miler might sound tragic or foolish, but this one really is neither. At the northern end of the longer-than-planned Stone Mill course there's still at least 5 miles to go. To avoid tripping in the dark on rocks and roots my pace is reduced to a walk. One would think that after multiple failures to complete long night runs — witness 2010-04-03 - Chocolate Bunny and 2010-05-15 - Half Massanutten Mountain Trails and 2010-08-27 - Cheat Mountain Moonshine Madness and 2011-09-03 - DNF The Ring and 2011-10-22 - Maryland Challenge, QSQB DNF — I would come to my senses and stop trying. So guess I'll just have to keep on truckin' until I finish some day, eh? The Stone Mill course goes through lovely terrain via Seneca Creek and Muddy Branch, with short connector segments along Gaithersburg sidewalks and the Potomac River. Today I meet a host of beautiful people. Barb Hrubesh jogs and walks the first 10 miles with me. She drove solo 14 hours from northern Maine just to be here today. Barb is a splendid storyteller and a master sandbagger, having completed 21 hundred-milers in recent years but only admitting it when pressed. She laughs at me for attempting über-tough Massanutten Mountain Trails as my first (and thus far, only) such experiment, and recommends instead the relatively "easy" Rocky Raccoon 100 in Texas. Hmmm, maybe next year? Connie Corbett begins the run at the back of the pack with Barb and me; she makes 31 miles (and takes some great photographs at next Saturday's MCRRC Turkey Burn-Off). 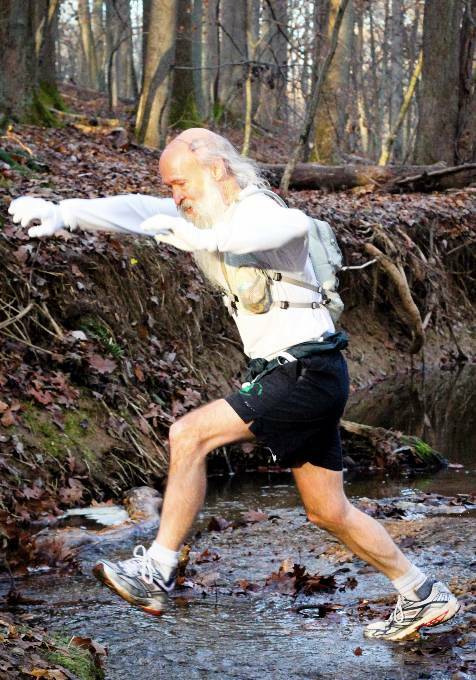 David Goodwin, ultra-cyclist, has never run more than a dozen miles before. He explains randonneuring to Caren and me as we ride back together from mile 48, and says that he did the 1200 km Paris-Brest-Paris Brevet in ~70 hours, napping only a couple of hours during that time. Mary Crann finishes Stone Mill this year, her mega-goal after falling short last time. She wears the same brilliant orange vest that I remember seeing her in when we met at the 2011-03-05 - Seneca Creek Greenway Trail 50k. Alexandra Fitzmorris is the youngest runner here, a student at St John's University in Annapolis. Carolyn Gernand cruises along in her traditional headdress. 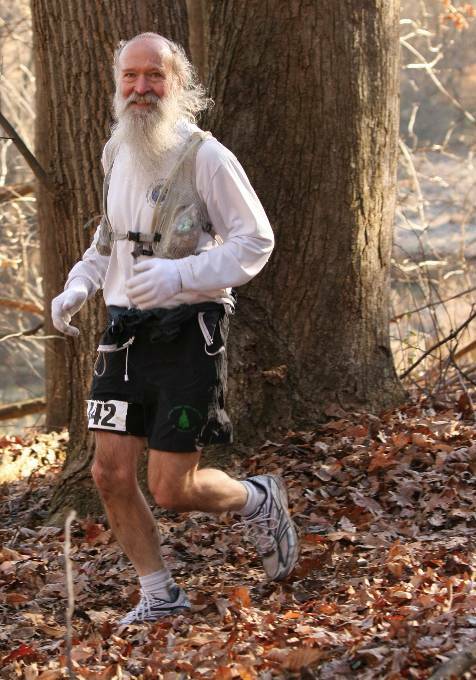 Matt Kersetter joins me about a third of the way along and tells me he was advised, "If you ever see an old gray-bearded fellow, stick with him and you'll finish!" Alas, not true today. We share brick oven pizza from a friendly spectator at mile 18. At the the C&O Canal Towpath I feel a burst of energy and run ahead of Matt, hitting ~10 minute pace for miles 20-23. We chat again at the end of the day. At mile ~25 I encounter Jackie Ong, who after finishing a marathon in every state now has taken up trail ultrarunning. Nearby Jonathan Brown is an avid triathlete. Ron Ely at the Route 28 aid station cooks up the best grilled cheese sandwiches I've ever tasted. After grabbing a couple I head out quickly, pass Jim Yi Dang near the Black Rock Stone Mill, then visit en route with Carole Williamson and Bob Phillips. Shortly before we get back to Route 355 there's cheerful Caroline Williams, slowing down and not feeling so great. "Want some candy?" I offer. Two miniature chocolate bars from my stash, in my pockets since the mile 20 aid station, apparently do the trick. Caroline goes on to finish, leading a group of other runners to that same successful conclusion. After 7pm I'm back at the start thanks to kind Caren, and discover Mike Edwards has just finished. Mike picked me up at 4:30am, drove me out to the race, and now has arranged for his buddy, fast marathoner John "Mugsy" Holten, to take us home. As we leave I shake Race Director Doug Sullivan's hand and thank him. What a fine day!